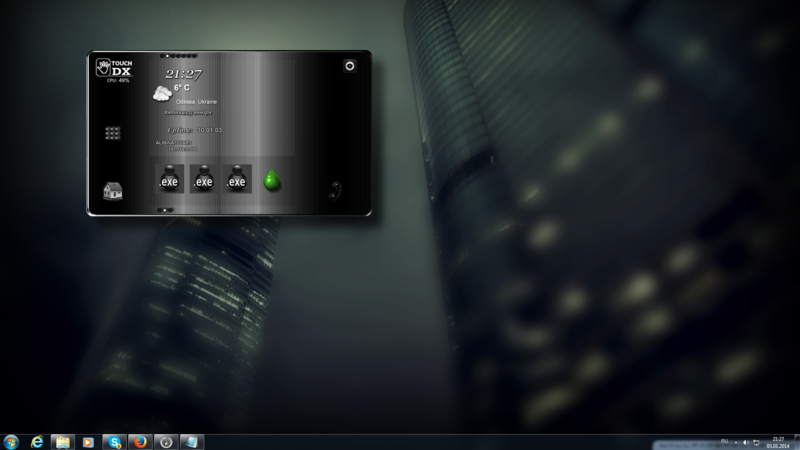 DX Theme "TouchDX" by Padre Kostya. Visit Link to find more theme skins. Thanks my Wife. She given me time to do it. support and helping and for permission to use it. Also I used sViz Weather script with my modification. Thanks Philip Powell for permission to use his Calculator script. Click on the hand symbol to see main screen. Keep Mouse Over Hand symbol(about 2-3 sec) to open or close main screen content. -Use Drag Mouse cursor to move inner screens left or right. -Use Mouse Left/Right click for object control, rename , set target. -Use Drag-drop picture.If the picture doesn't change use object properties in DX Builderto do it. - Use Mouse Right click to hide main screen. Nice job, only I get an error with the net meters. The Theme updated and Net Meters removed from Theme content.